Date Night needs to take out a loan for our last two dates. If you think that last week’s anniversary celebration at Empire State South was a splurge, wait until you get the bill for the date at Gunshow. Will the restaurant hit the target? 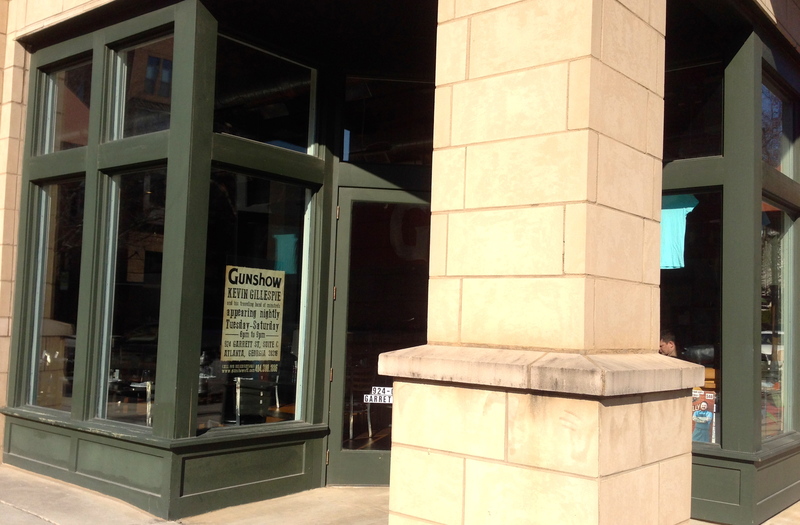 Gunshow is located near Zoo Atlanta in the Glenwood/Grant Park area. There’s no sign. We drive right by it before we figure out where it is. (Useful tip: there is off-street parking behind the building.) The wait for a Friday reservation here is about a month. I take a shot in the dark and call on Monday for a table on Friday. I am able to sweet talk the reservationist into giving us a table for two. There’s no traffic on our route tonight, and we get here faster than a speeding bullet. Our table is this close to the open kitchen, and tonight we will get dinner and a cooking show. The best way to describe the concept here is to think dim-sum without the Chinese food. The chefs make the food in the kitchen, and when it’s done, they take it out into the dining room and ask you if you want it. You can pass or play, depending on what you like. We hope that we do not hurt the chef’s feelings when we pass on a dish. 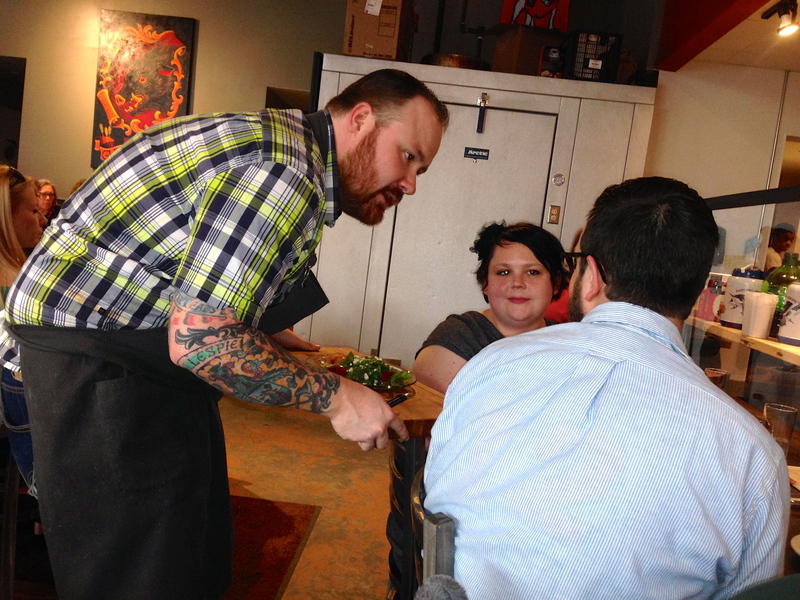 Speaking of cooking shows, some of you might recognize Chef Kevin Gillespie, who thought this whole thing up. He’s a Top Chef winner, and he’s here in his restaurant, cooking and serving just like the other five or so chefs in the kitchen. We’ve been to other celebrity chef restaurants and we can assure you that their owners were not within ten miles of the place when we were there. 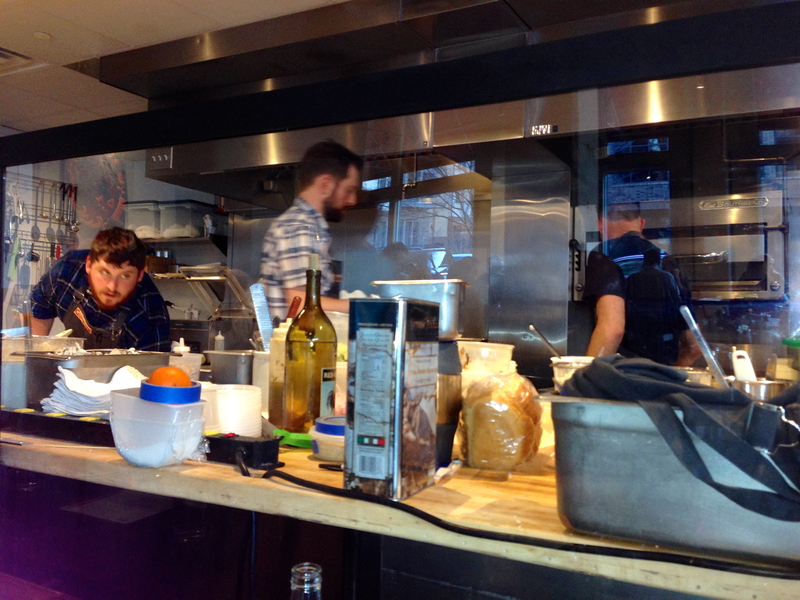 It’s very cool to see Chef Gillespie cook only a few feet away from us. 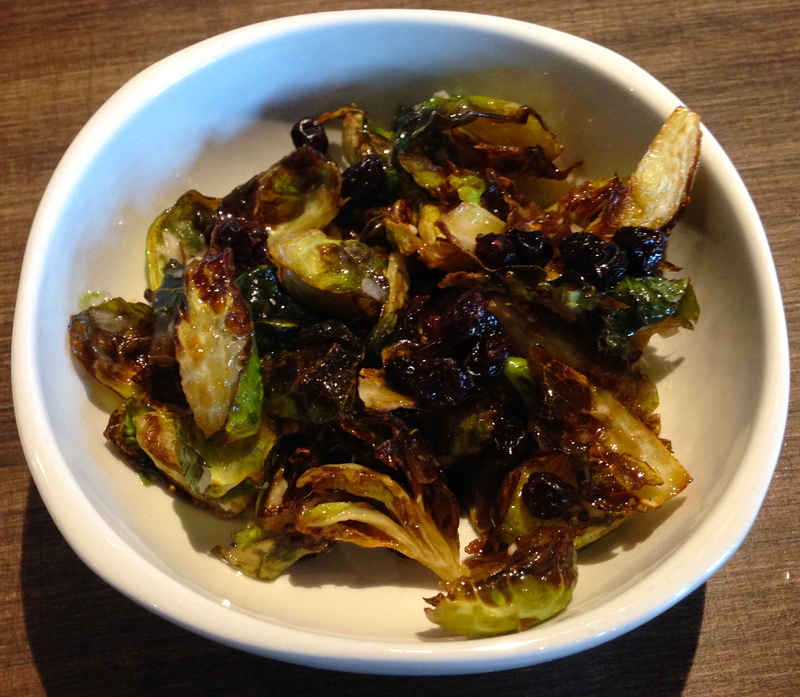 Before we even get our beer, a dish of Brussels sprouts appears. As these are one of our favorite starters, we eagerly accept them. It’s a good thing we do, because these have surpassed the sprouts at the Happy Belly food truck as the best in Atlanta. Maybe it is the marinade or perhaps it is the fact that they are crunchy yet soft. These are amazing sprouts. 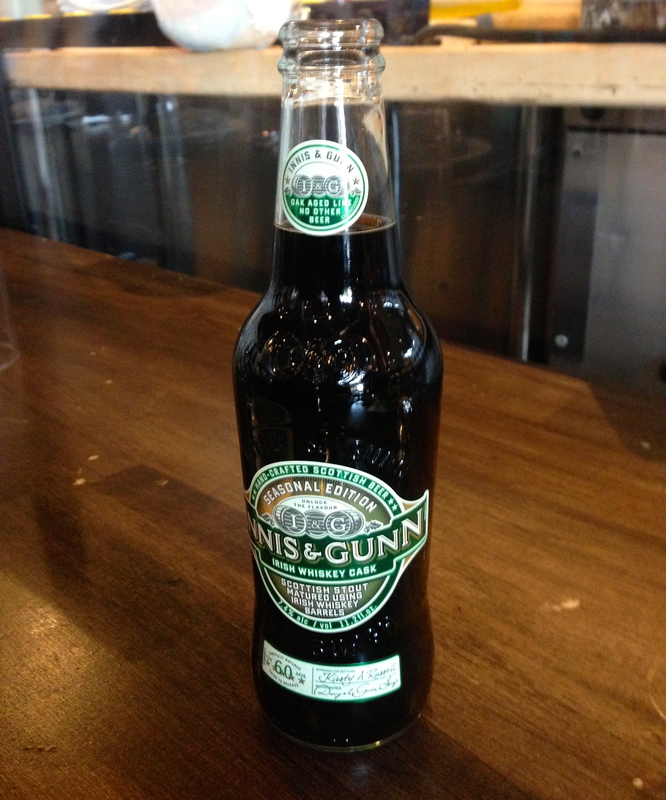 The Innis & Gunn is a special seasonal beer for St. Patrick’s Day and is aged in Irish whiskey barrels. There’s a lot of alcohol in the beer, and the subtle taste of the whisky is a wonderful combination. 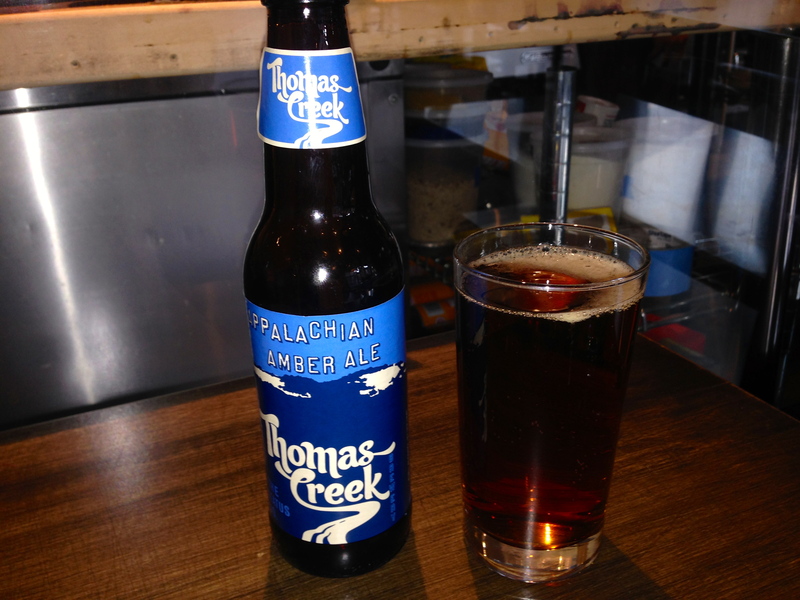 Eve goes for something less strong, the Thomas Creek Appalachian Amber, a malty brew from Greenville, South Carolina. 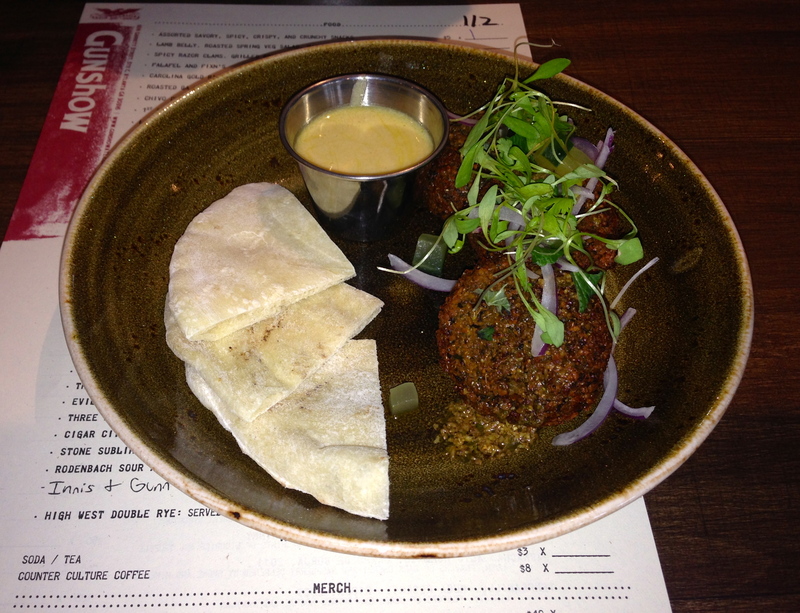 The next dish we accept is the falafel, which comes with pita points and a tahini sauce. The breading is light, covering the dense, warm and flavorful chickpeas inside. 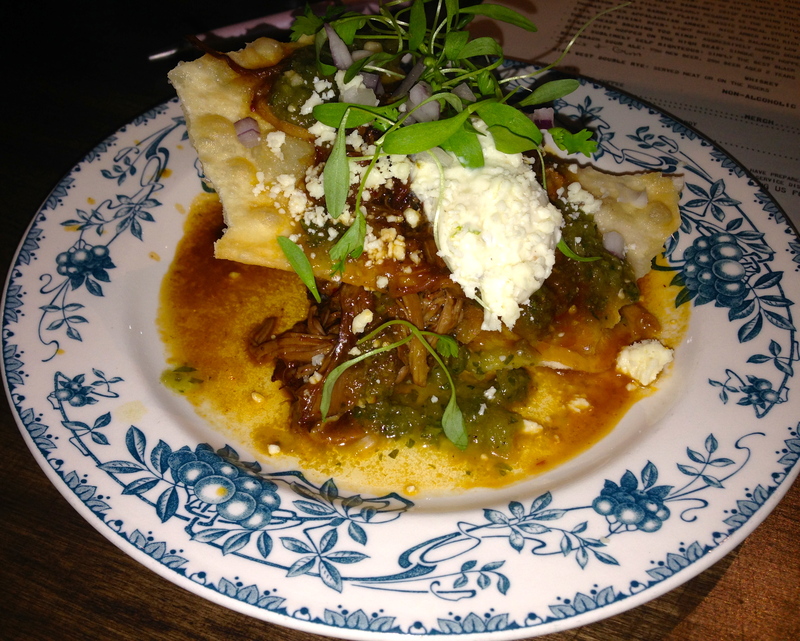 We pass on the lamb belly and take the spicy braised goat next. It’s made from goats grown in Cobb County. There’s a lot of heat in there, and it makes my head sweat. I really liked it, but beware if you don’t like spicy food. The goat is hard to share because the crunchy shell is hard to cut in half. Chef Gillespie delivers our next dish, the shrimp crudo. We don’t know whether to eat it or ask him to autograph it. It’s all fresh and all good. 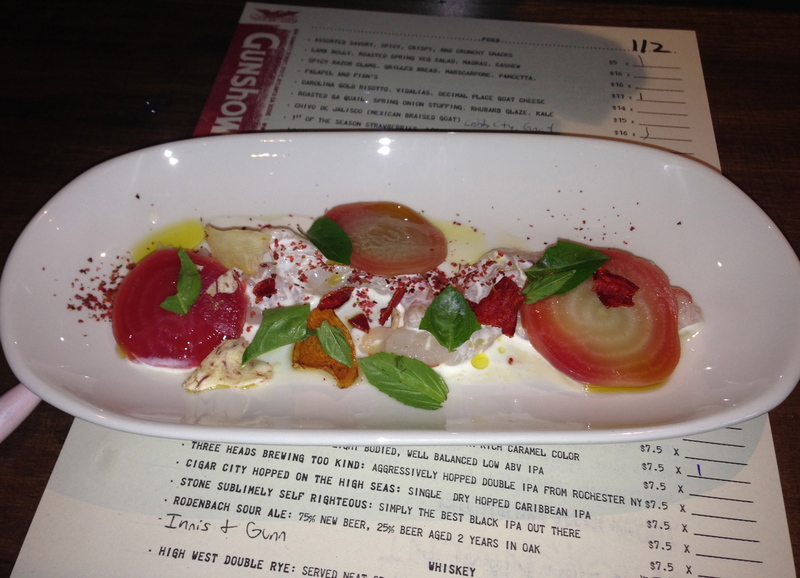 I really like the beets that come with it, and I usually don’t go for beets. Under the plate is our “scorecard”, everything that we can choose from tonight. As the chef serves you, he marks it off so that they know what to charge you for when the meal is over. We have been watching one chef cook ribs all night and we really want some. He brings them out on his cart and goes the opposite direction from us. By the time he gets to our table, the ribs are gone. 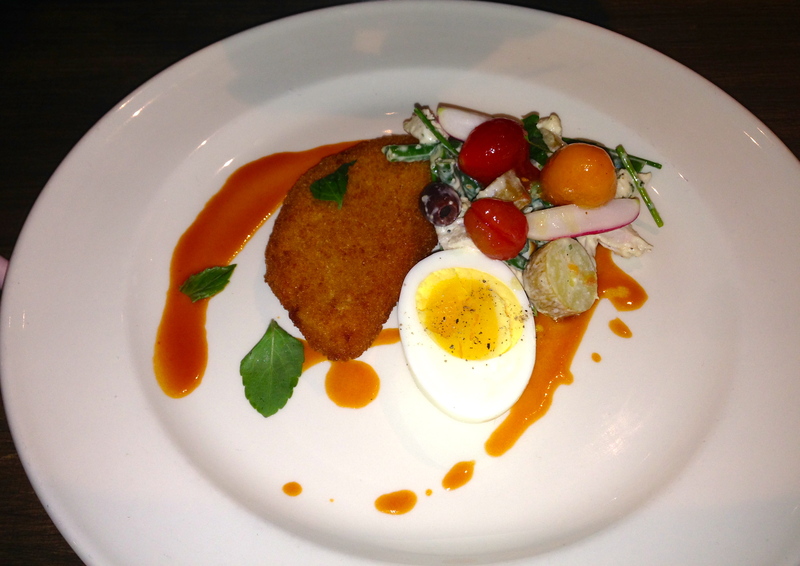 Chef Gillespie rides to the rescue with a rabbit fritter surrounded by rabbit nicoise. It’s a bonus dish that isn’t even on the menu. Eve finds the rabbit to be a little gamey. The nicoise is a nice touch and reminds us of our trips to the south of France. 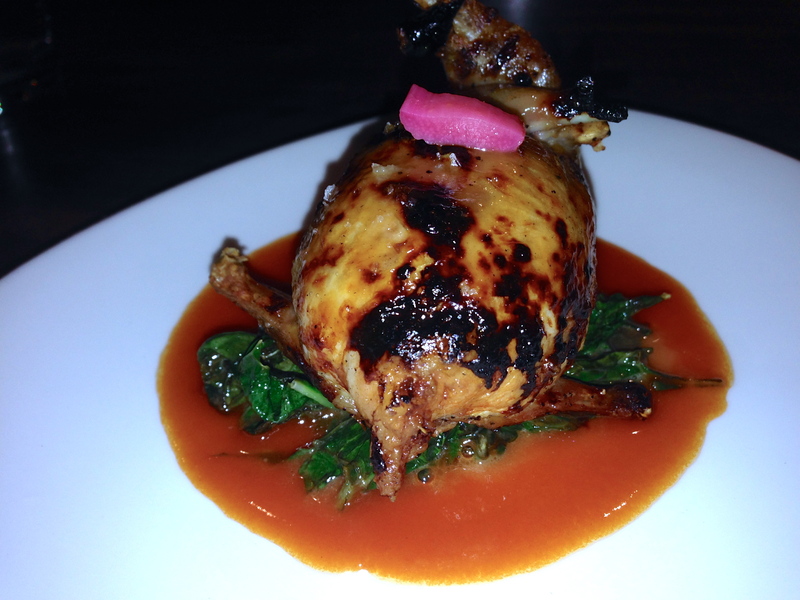 The quail comes stuffed and covered with a rhubarb dressing. That’s kale underneath the quail for those of you who like to rhyme. We think this is the best dish of the night. The quail is moist and surprisingly meaty. The stuffing is fabulous. More ribs come out, but they go to a large table for 12. We don’t think we are going to get any. We ask a server to try to track some down for us. 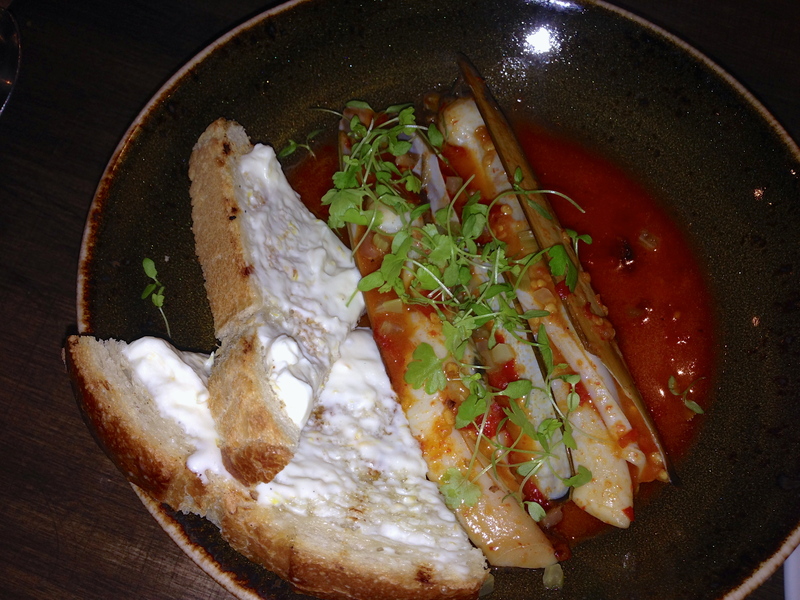 We do get the spicy razor clams. The long, narrow clams come with bread and marscarpone cheese. The marscarpone helps to cool off some of the heat from the clams. After a long wait for the ribs, we decide to pack it in and try a dessert. Right before the dessert comes, the rib chef shows up and kindly offers us the first ribs of a fresh batch. We are too full to accept. Here’s the only problem with the concept–sometimes you see things that you really want, but they don’t make it to your table. And if you miss out, you may not have another chance to get them. Oh well, perhaps that is an excuse to come back, although the menu changes every night. 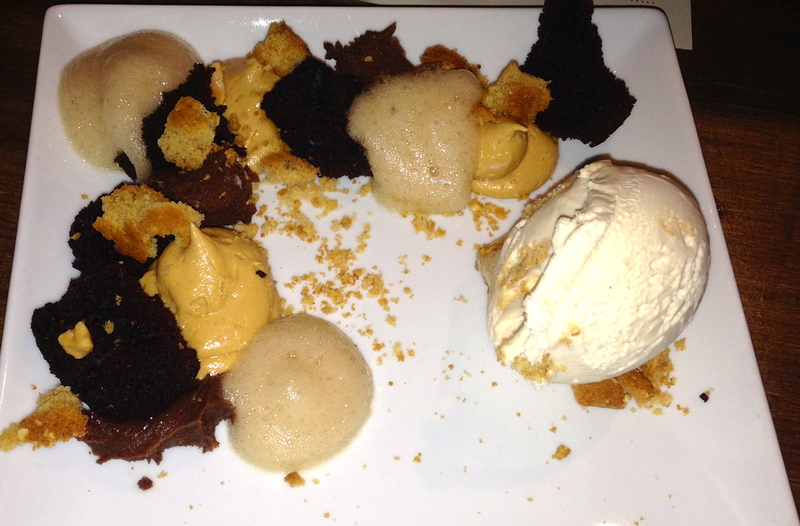 Our dessert is called “chocolate, peanut butter and other stuff”. The chocolate and the peanut butter are soft and gooey. The “other stuff” is ice cream and root beer foam. We probably didn’t need the extra calories, but this is a nice finish to rootin’ tootin’ good meal. 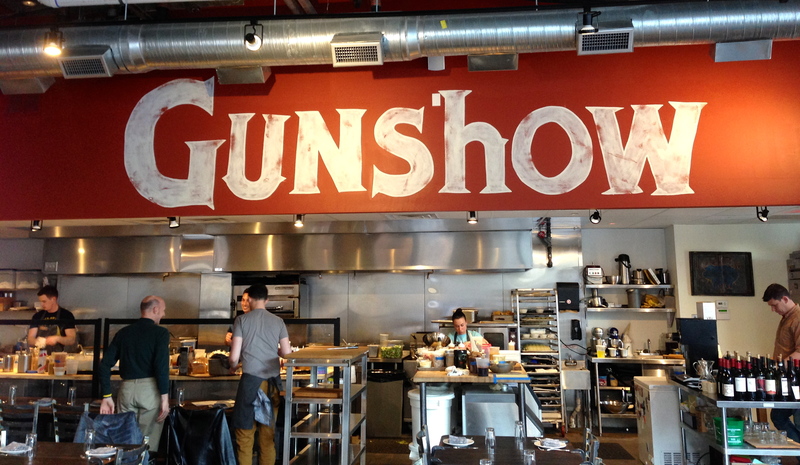 The bottom line on Gunshow: If you don’t get lucky after taking a date here, it’s you, not the Gunshow experience. It’s loud, it’s busy, it’s entertaining, it’s interactive, and it’s fun. It’s also expensive, so be prepared for a large bill when you are finished. 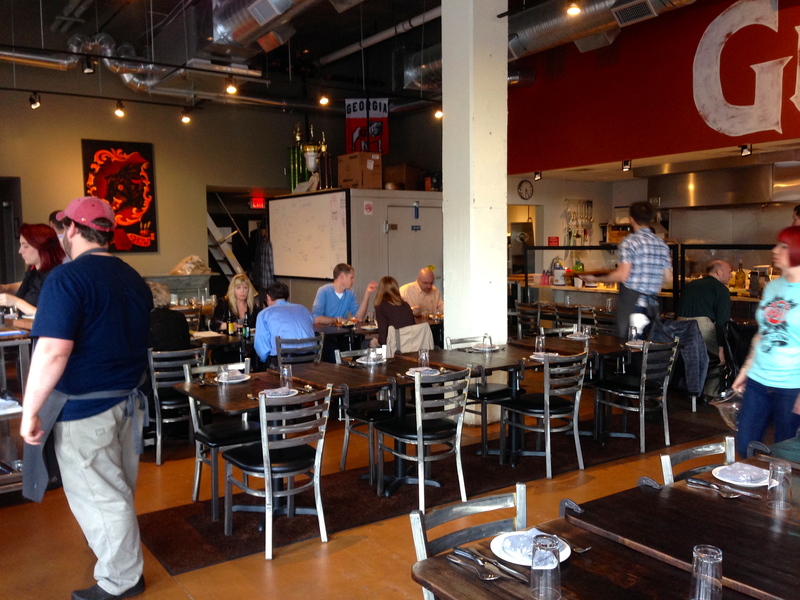 Chef Gillespie has hit the bullseye with this restaurant. The chefs are having a good time and you can see the joy as they cook. We don’t expect that the dim-sum concept will revolutionize the non-Asian Atlanta dining scene, but it certainly works here. It looks like y’all had one heck of a meal! What a cool concept for a restaurant, and those claims look delicious. The clams were good, and they packed a lot of heat! Nice review. I loved our visit there last year – can’t want to return. C’mon how much per person? About $60 a person without the tip. The prices on the menu include tax! that’s not too bad… thought it might be $100.